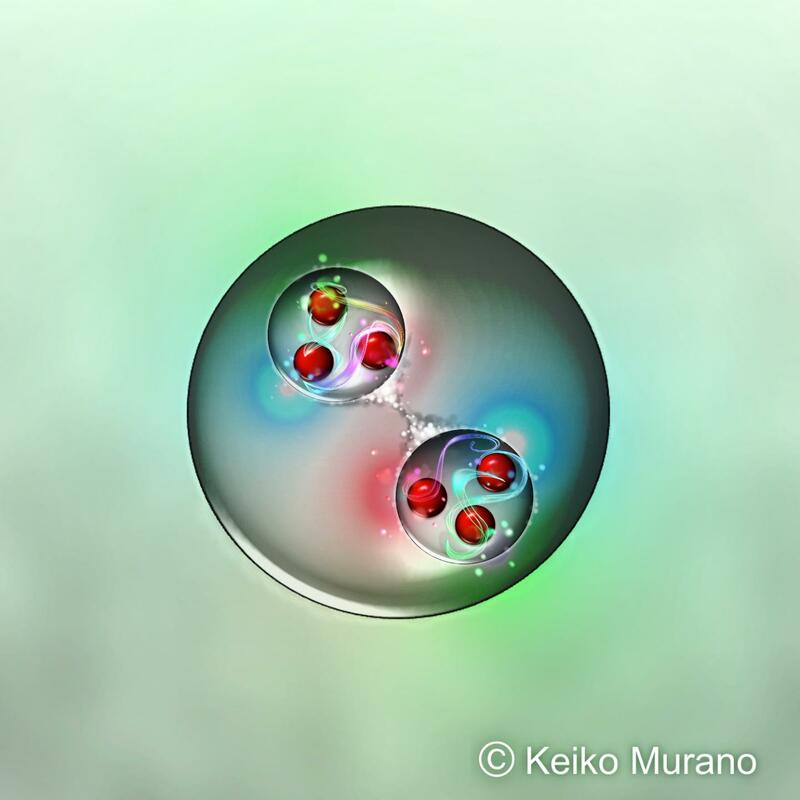 Based on complex simulations of quantum chromodynamics performed using the K computer, one of the most powerful computers in the world, the HAL QCD Collaboration, made up of scientists from the RIKEN Nishina Center for Accelerator-based Science and the RIKEN Interdisciplinary Theoretical and Mathematical Sciences (iTHEMS) program, together with colleagues from a number of universities, have predicted a new type of "dibaryon"–a particle that contains six quarks instead of the usual three. Studying how these elements form could help scientists understand the interactions among elementary particles in extreme environments such as the interiors of neutron stars or the early universe moments after the Big Bang. Particles known as "baryons"–principally protons and neutrons–are composed of three quarks bound tightly together, with their charge depending on the "color" of the quarks that make them up. A dibaryon is essentially a system with two baryons. There is one known dibaryon in nature–deuteron, a deuterium (or heavy-hydrogen) nucleus that contains a proton and a neutron that are very lightly bound. Scientists have long wondered whether there could be other types of dibaryons. Despite searches, no other dibaryon has been found. The group, in work published in Physical Review Letters, has now used powerful theoretical and computational tools to predict the existence of a "most strange" dibaryon, made up of two "Omega baryons" that contain three strange quarks each. They named it "di-Omega". The group also suggested a way to look for these strange particles through experiments with heavy ion collisions planned in Europe and Japan. The first essential element was a new theoretical framework called the "time-dependent HAL QCD method": It allows researchers to extract the force acting between baryons from the large volume of numerical data obtained using the K computer. The third element was the advent of powerful supercomputers. According to Shinya Gongyo from the RIKEN Nishina Center, "We were very lucky to have been able to use the K computer to perform the calculations. It allowed fast calculations with a huge number of variables. Still, it took almost three years for us to reach our conclusion on the di-Omega." Discussing the future, Tetsuo Hatsuda from RIKEN iTHEMS says, "We believe that these special particles could be generated by the experiments using heavy ion collisions that are planned in Europe and in Japan, and we look forward to working with colleagues there to experimentally discover the first dibaryon system outside of deuteron. This work could give us hints for understanding the interaction among strange baryons (called hyperons) and to understand how, under extreme conditions like those found in neutron stars, normal matter can transition to what is called hyperonic matter–made up of protons, neutrons, and strange-quark particles called hyperons, and eventually to quark matter composed of up, down and strange quarks."